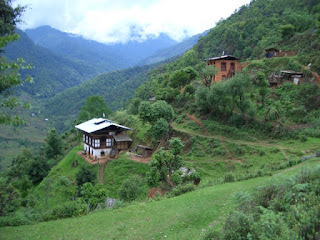 Bhutan is beautiful and much of this country of 900,000 is bucolic, but is it the Himalayan Shangri-La that champions of its policy of Gross National Happiness (GNH) believe it to be? To be honest, it depends on what you look at and how you measure what you see. The concept of GNH was first articulated by the 4th Dragon King, Jigme Singye Wangchuck in 1972. His goal was to build an economy that would serve his nation's culture based on its Buddhist spiritual values rather than western measures of material and economic development. To that end, a scale was developed to measure prosperity through the spiritual, physical, social and economic health of its citizens and the natural environment. The country has made strides since 1972. 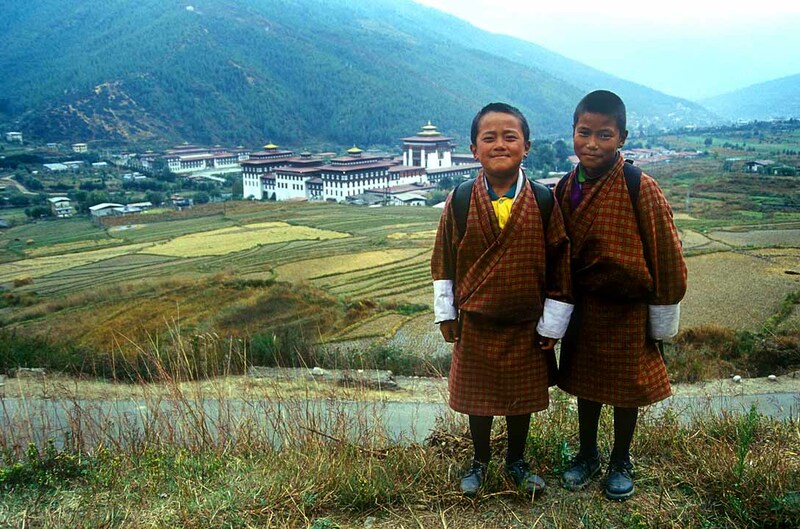 On the books, Bhutan has universal health care, free education through 10th grade and a healthy relationship with its neighbors, particularly India. Nutrition has improved and life expectancy has risen substantially since the early 2000's. 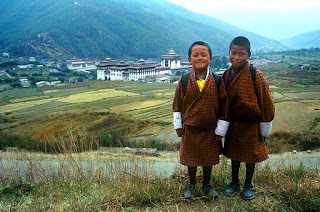 Bhutan makes education available to all its children, but because this is a Buddhist country, it is offered rather than mandated,and there are still children who do not attend school. There also seems to be an imbalance in the way services are provided. Those in cities appear to be the major recipients of the benefits the government now provides. Most of the laboring population can be found in the country-side, living in 3 story rammed earth dwellings near fortresses called dzongs. The lower level of the structures house animals and the upper floor is used for storage. The second level contains kitchen and sleeping rooms as well as a shrine or prayer room that appears in all Himalayan Buddhist homes. 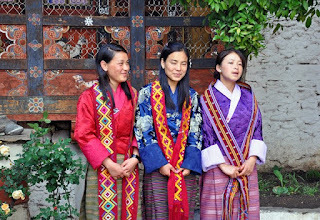 To maintain its cultural identity, school children, those who work for the government and anyone associated with the tourist industry are required to dress traditionally. Men wear the gho and women wear the kira. Gho is a knee-length dress like the Japanese kimono and has some resemblance to the Scottish kilt. Women wear ankle length piece of long skirt-like dresses supported by clips designed like brooches that are placed on the shoulders. A short jacket called a tego is worn to complete the woman's outfit. Bhutan has standing army and it opposes immigration. It has closed its border with Tibet and forced out many Nepalese residents in what many call an ethnic cleansing. While the law in Bhutan provides for religious freedom, it is a paper promise that is not backed by observable fact. The border with India remains opens and citizens of either country are free to move back and forth across it. 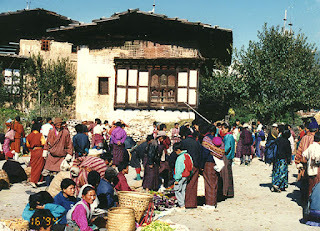 Bhutan depends heavily on neighboring India for migrant labor, foreign aid, and trade. Therein lies the problem. While its citizens are taxed. revenues can't begin to cover the cost of health care, education and expansion of the infrastructure. 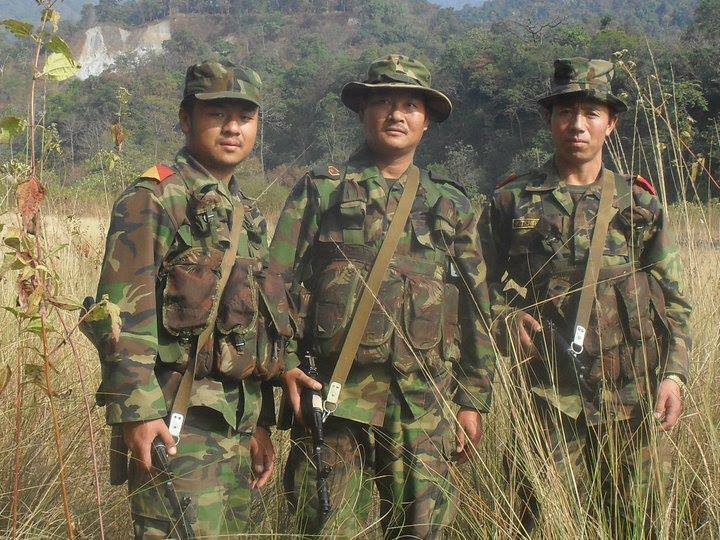 Bhutan is completely dependent on India and someday that bill will come due. Hopefully, they will be ready for it. Thanks for sharing your travels with us. I hope that you will also share some of the foods of the country. Home safe!! Mary, you have such wonderful travels! I don't think it would dawn on me to travel to Bhutan - although it looks beautiful and I love how they are trying to preserve their culture. Such precarious times for these small countries. Such cultural wealth mixed with difficult times.